Sterilize the instruments and keep them that way: keep instruments off possibly contaminated surfaces, and flame them to incinerate loose material which might fall off. Never lie pipets down on the surface of a workbench. Sterilize the field where work is to be performed with 70% EtOH. Minimize drafts: no breathing, coughing, etc over sterile materials. 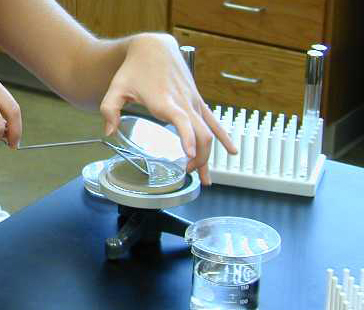 Mastering sterile technique is one of the most important prerequisites to working in a microbiological lab. While the steps may seem overly detailed in the following narrative, early care in learning proper technique establishes good technique for the rest of your life. Compare these detailed steps with the demonstration given by the professor. Patience pays off. Go slowly at the beginning, and verbally (not physically) assist your fellow students as they work through the steps. Write out the procedure which you plan to perform in your notebook. 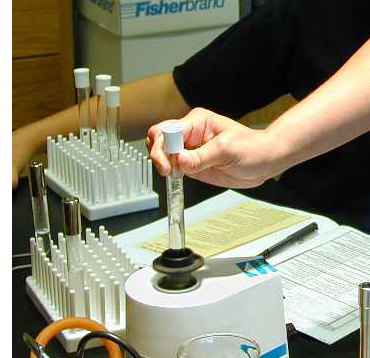 Indicate how the sample was prepared and volumes to be transferred. Construct a table of plates to be spread, with plate number, specimen, plate type, dilution factor, aliquot, and two empty columns for colonies counted and final calculated numbers. Label tubes or plates appropriately. Loosen all caps, mentally review the steps you will be performing and arrange materials to ensure they are available and easily accessible. 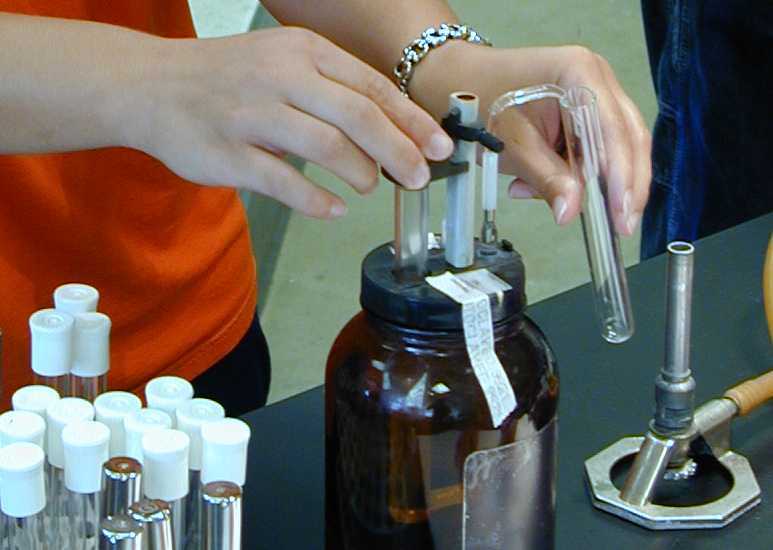 Select the appropriate pipet for volume to be delivered, and set the volume to be transferred by rotating the plunger. Pick up a sterile tip, reclose the lid on the box of tips immediately. Hold displacement pipetter so that the thumb operates the plunger and you keep your little finger on the pipetting hand free for grasping the cap of the vessel. Pick up specimen vessel with other hand, grip cap of vessel with little finger of pipet hand and twist the vessel and pull it down away from the cap. Do not lay the cap down. DRAW UP SPECIMEN: Immerse tip of pipet 1/2 cm below surface of liquid, brace in place by gently pressing pipet against the lip of the tube while drawing the fluid up. To avoid bubbles, draw the fluid slowly into the tip by slowly raising your thumb. Reflame the lip of specimen vessel, screw it back into the cap, set vessel down. DELIVER ALIQUOT: Pick up receiving vessel. Remove its cap and flame its lip (as in steps 5 and 6). Insert pipet, return to vertical, deliver desired volume, remove pipet, flame lip, replace cap, discard tip into used pipet container for sterilization. The plate count is one of the most accurate means of enumeration of viable microbes because you get a visual indicator for every cell in the specimen. The technique stems from Robert Koch’s insight gained from viewing colonies growing on the surface of a spoiling slice of potato. 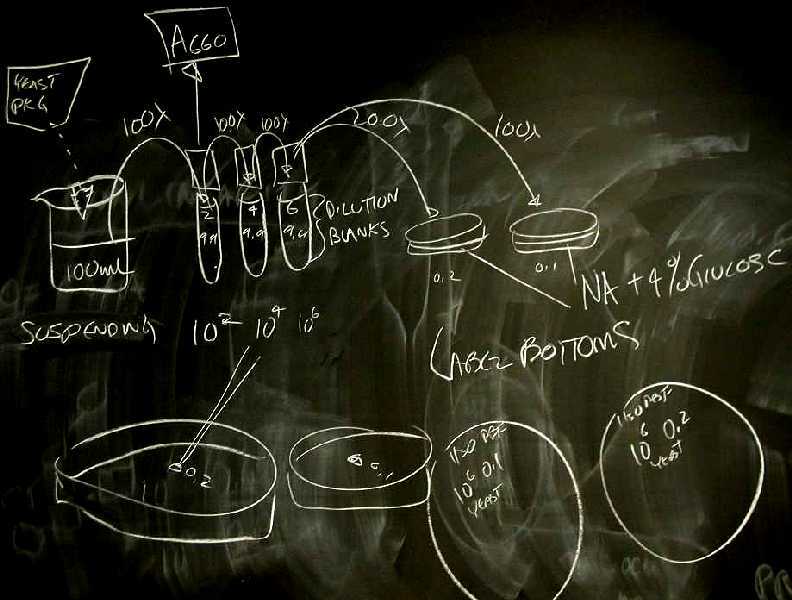 In practice, a small aliquot of a liquid suspension of microbes is spread on the surface of solidified nutrient medium, which when incubated, leads to each cell ‘developing’ into a visible colony through repeated fission. Many samples may have so many microbes that even a small aliquot would have more than the 30-300 colony forming units per aliquot. In that case, the sample must be diluted to roughly 300-3,000 CFU per mL of which 0.1 mL can then be plated out. THREE PROGRESSIVE WORK STATIONS ARE SET UP. First weigh full package of yeast, then suspend contents in 100 mL water. Mix thoroughly (magnet-o-stir works well) for 5-10 minutes . Weigh empty package, determine the dry weight of the yeast added. Create a data table in your notebook in which you list the plate number, the specimen, its dilution factor, the aliquot plated, a space for the number of CFUs on each plate, and room for calculation of total CFUs in the original sample. Repipet 9.9 mL sterile dH2O into each of three sterile 16 x 150 mm capped tubes. Here is a close up of a repipet set for 9.9 mL . Note the calibration stem with moveable clamp, the plunger (which is raised up all the way and then depressed all the way to deliver the volume), and the spout. Label the tubes 2, 4, 6 (for Yeast Plate Count 10 2, 104 and 106 dilutions). Determine the A660 of the 10 2 dilution , record in your book and on the computer. Insert the tip just below to surface and release the thumb plunger to draw up the aliquot. Count the number of colonies . Here are sample plates: a 0.1 mL plate (41 colonies), and a 0.2 mL plate (89 colonies). 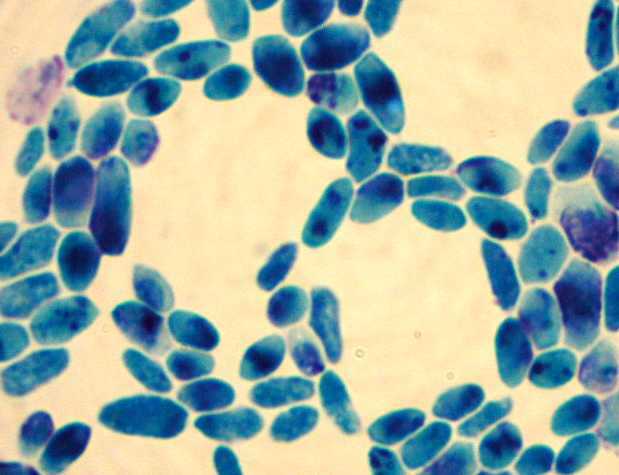 Smear and stain examples of a yeast colony (Note how the colonies appear “waxy,” from where baker’s yeast gets its specific name, cerevisiae) and a contaminate, staining with methylene blue, illustrate at 1000x . 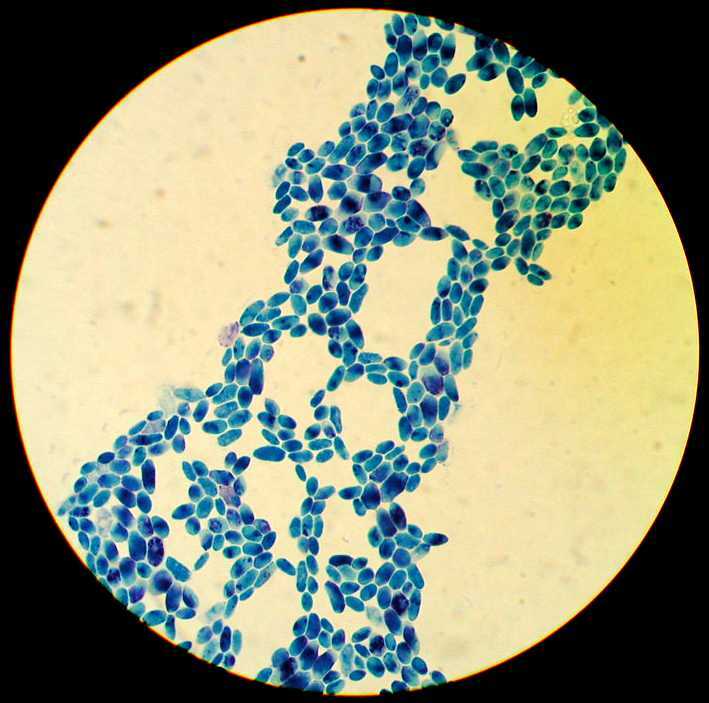 Note in this closer view the staining of the organelles in the yeast cytoplasm . 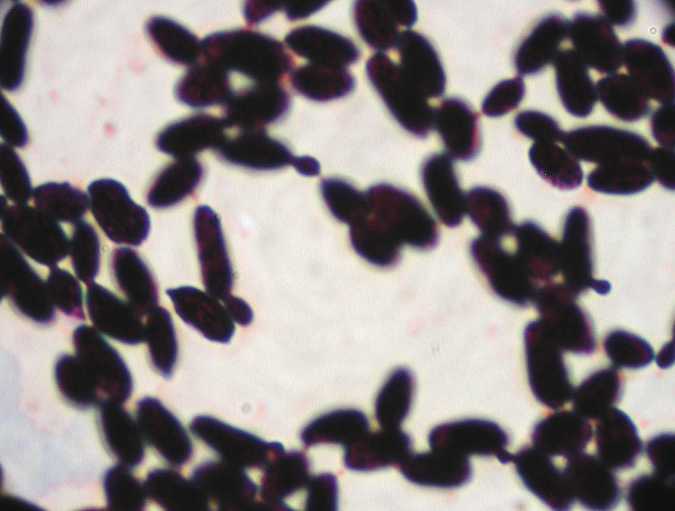 Here is yeast stained with the Gram stain , a closer view , both of which show budding. 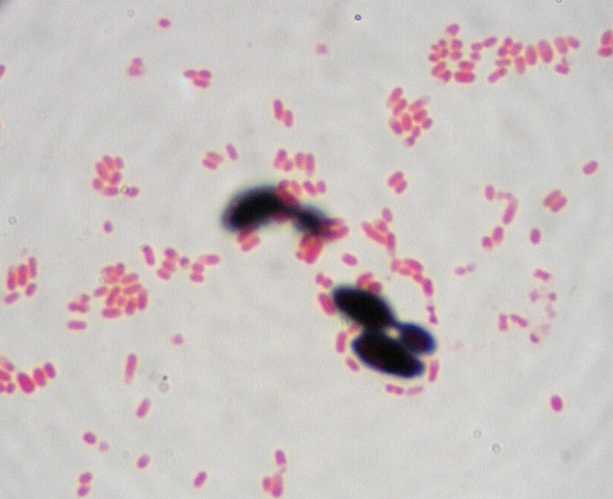 This view of yeast plus E. coli contrasts their different sizes and staining properties. 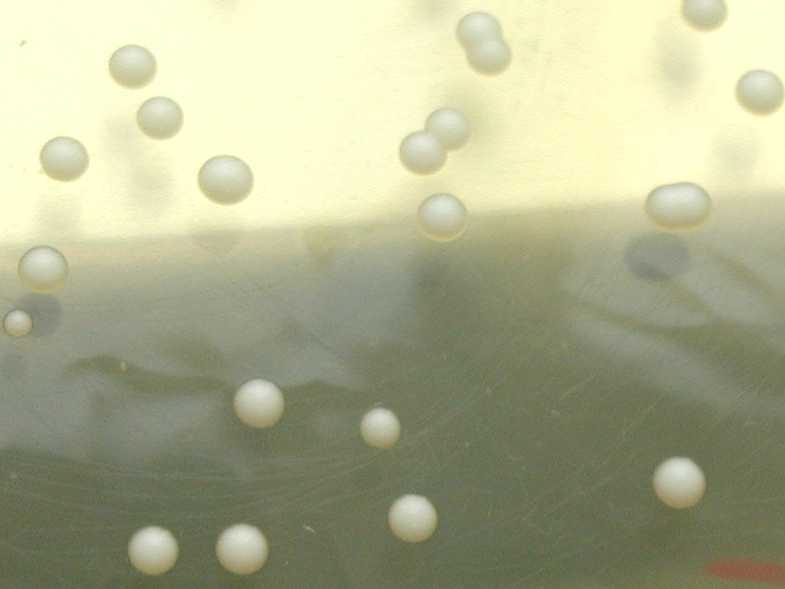 In Summer of 2011, two students got tiny colonies on one of their two yeast plates. 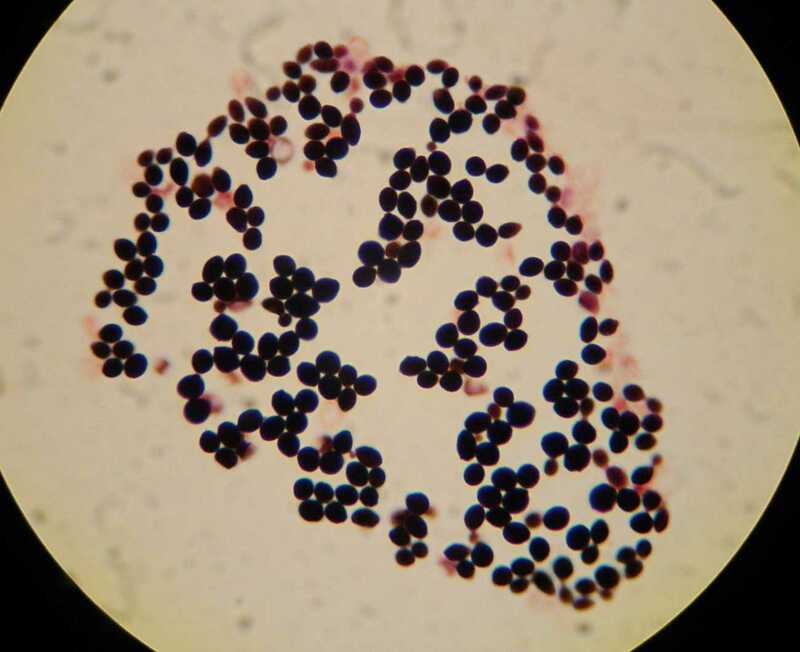 A gram stain showed them to be more spherical than normal, and the presence of numerous ‘ghosts‘. 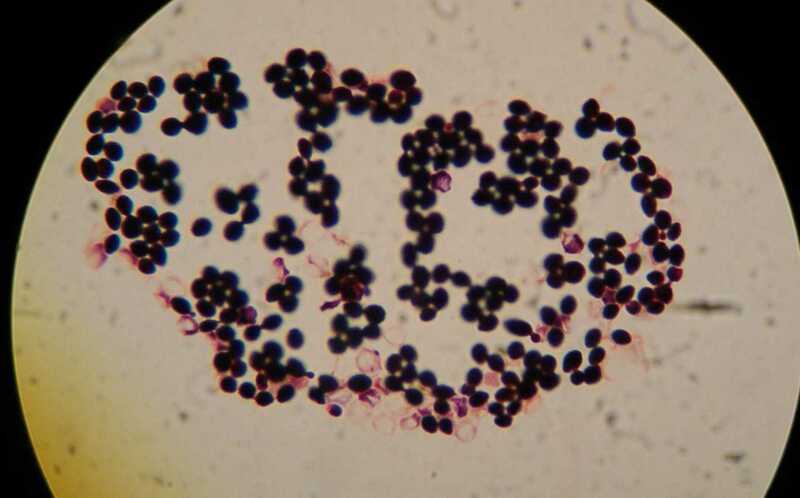 Here is another image of these affected yeast. 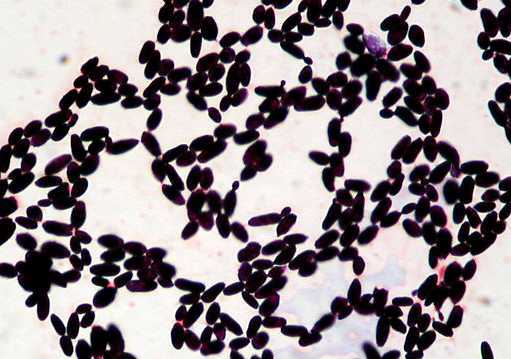 Could they be infected with a Killer” virus which infects Saccharomyces?